Sunday 3rd August – dull gloomy weather with rain. Spent the day ashore at Dartmouth. Monday 4th – fine weather. On shore at Halifax in the forenoon – on board in the afternoon. Tuesday 5th – fine weather. Spent the forenoon on board. After dinner went over with Captain to Dartmouth – & visited the Canal & the Indian camp. Wednesday 6th – very fine weather. Remained on board all day, employed in sundry little jobs. Thursday 7th August – fine weather – dined at M.r Binnie’s. Friday 8th – fine weather – on board all day. Saturday 9th – very cold and variable weather – on board & on shore several times during the day. Formerly when we came to Halifax, we made only 24 hours stay and then started off for Bermuda. But since that time a material change has taken place – and one in my opinion infinitely for the better. In stead of hurrying off for that miserable hole Bermuda, and enduring the extremes of heat and cold, the Packets now conclude their voyage at Halifax, while their mails are carried to Bermuda by two Schooners. Eight days then are usually spent in Halifax to allow time for the overland & Boston Mails – but more frequently the Packets are detained 10, 12, or 14 days. Hence the Halifax voyage is now generally performed in 8 or 9 weeks instead of 12 as before. Altho we have been so long in Harbour, and have visited both Halifax and Dartmouth, which you may remember are on opposite sides of the Harbour, I can say very little in addition to what I have said in my former journals. I like them both very well, and have never spent a week so comfortably in any foreign port as in this. The weather has been in general very fine – sometimes very cold from change of wind – the country looked charming – the roads were excellent, and on the Dartmouth side wended thro’ woods. The only novelties to me were the Indians and the canals, & to these I shall draw your attention. The Indians are here in considerable numbers. They have several scattered encampments along the sea shore and in the woods. Visited one of these situated on a point of land opposite the Dock yards. Nothing could be more simple or inartificial than their dwellings. They were in the form of a cone – constructed of long sticks resting against each other at the top, & these again covered with the bark of trees. I question whether they are either wind tight or water tight. A small space is left for a doorway – I mean for an entrance, for door they have none. In general this is open entirely – but some have the decency to stick up some old rag, [such] as a petticoat or coat to preclude the gratification of impertinent curiosity. In the centre the fire is usually placed – and this is always lighted. Around this, the Indians sit or lie on some dry ferns and at night always sleep in a circle with their feet to the fire. When the entrance is shut, the smoke escapes thro’ the interstices between the stakes at the top – nay some purposely leave a small opening there. 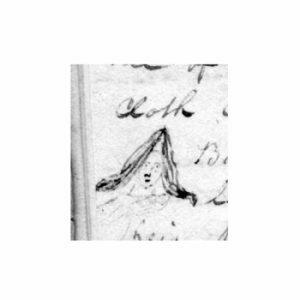 Both men and women wore their hair long and loose, which together with their flat noses, high cheek bones and copper complexion, rendered their tout ensemble anything but handsome or prepossessing. The Indians chiefly employ themselves in making baskets and various ornaments of porcupine quills, which they carry over in their canoes to Halifax in the morning to dispose of and return in the evening to their habitations.As a matter likely to interest me I was taken to see a portion of a canal, by which it was proposed to connect the Bay of Fundy with Halifax, and by which wood might be brought with facility from the interior. Great expense has been already incurred, and the undertaking is far from being completed. The work is at present at a stand still from want of funds. I saw several locks, which seemed well built and well adapted for the purpose. The whole length is about 50 miles but it is not all excavation –but merely several lakes are connected together thereby greatly facilitating the work. One of the lakes (a small one) is near Dartmouth. It is a beautiful piece of water & there is a delightful walk along its margin. It lies in a hollow and around it the country is elevated and woody. I was therefore much pleased with our excursion in that direction, as it was certainly the most beautiful I had seen.